It's So Easy Being Green: Death to the oversized t-shirt! Maybe it's not a great idea to take scissors to fabric after midnight and/or a couple glasses of wine, BUT I think I'm on to something here...I've repurposed 3 oversized t-shirts into tank tops! Problem 1: I have a gazillion XXL t-shirts that I only wear to sleep in or to exercise. How do we end up with so many free t-shirts that get consigned to the sleepwear/exercise/bum around the house category? (I want to see companies/events start to give out shirts in women's sizes and if they're too small for guys, tell THEM to deal with it--give it to a girlfriend, use it for when you dress up in drag on Halloween, whatever. I'm tired of men's sizes hegemony. Hmph.) 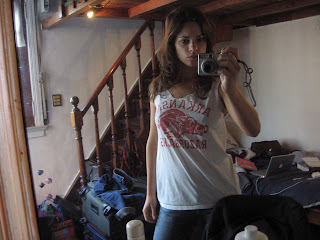 For some reason I brought 3 of these offending shirts with me on my trip to Argentina, ostensibly to sleep in. I mean, these are bad--so unflattering that I would probably not even wear them around my own family. Problem 2: I need tank tops for my upcoming travels to other parts of the country and don't want to spend the money on cheap, poorly made ones. So now I've killed 2 birds with 1 stone and have 3 tank tops that I would actually wear out of the house, and 3 fewer unflattering sleep-only t-shirts. The sample shirt pictured was actually my dad's around the time I was born. It's quite sentimental because the Univ of Arkansas is both his and my mom's alma mater. 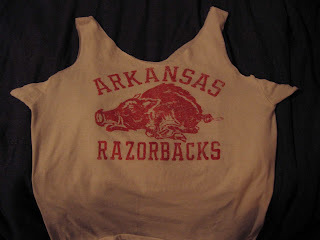 I hesitated to cut into it, but I'm pretty sure they would rather me actually get good use out of it and "represent" the Razorbacks in public, even if it means altering its original shape, right? Let's hope so. 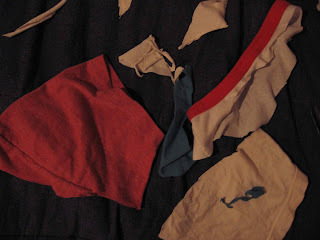 Here's what to do to make your own original (albeit, quite "funky") tank tops. 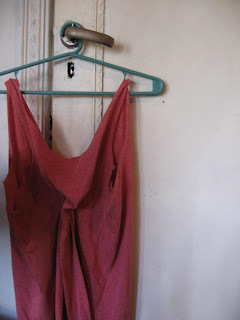 1) Find a "real" tank top with a shape you like to use as a pattern. Place it over the t-shirt so that you can visualize the shape you want, and start cutting. I do the neck first, and you can get creative with that shape. So many choices: v-neck, crew, zigzag, whatever! I've been cutting the necks out of shirts for years because tight necks happen to be terribly unflattering on me. A word of caution: On your first pass, cut less than you might assume you should, unless you're going for the Flashdance look. 3) Sew the arm holes together. Try on the shirt and pin the arm flaps together. This is your chance to get creative with the stitching. 4) Optional: For a more fitted look, gather the fabric at the center of your back add a few stitches. This is what I call the Gap mannequin phenomenon: You know how their shirts always seem so well fitted on the mannequins, and then you feel misled when you walk around to the back and see that they are clipped? Well, there's nothing stopping you from doing this to your own shirts with a few stitches. Maybe it's the wine talking but I like the way this one turned out. Sorry about the bad shadows--the lighting in this room is not so great. 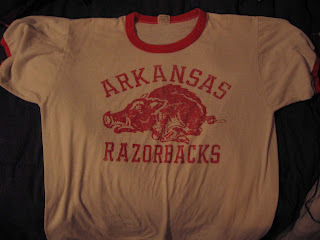 Here's the new and improved Razorbacks shirt. I don't have a "before" pic, but trust me, this is a big improve- ment. It's settled...I'm never buying another tank top again. Oh, and the scraps from the neck band? Headbands, of course. Nice job :) We too have a lot of old oversized T-shirts. I cut them up. My kids and I tie-dyed them and made napkins. So these otherwise landfill items end up saving paper towels. Now we pretty much have no need for paper towels other than when we have guest over. That's such a great idea! I love the idea of tie-dying them..truly making them into something new and special! you mad scientist you! they look dope. I totally agree with you about the default ridiculously large give-away men's T-shirt. I have an awesome Angel's T that I've never worn because it was made for a 200 lb man. Ha. Now I know what to do! great idea! I got thousands (yes, I DO like exaggerating) of them things lying around! 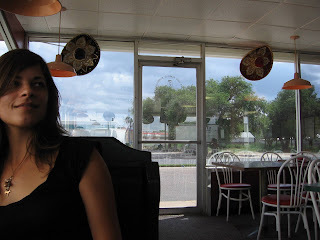 I'm trying to put together some contributors to a 'green' blog. After taking a look at your posts. I would like you to think about it. feel free to not post this comment. That's such a great idea! I love the idea of tie-dying them..
What, and throw away my leverage. Sure, she anddedicated nanobots had worked to tighten the belly above her rounded pudendato a womanly curve that, while convex, suggested solid musculature, ratherthan fat, but everything between that and the carefully crafted hollows of herinner thighs Teela had been born with for Leegates to pick out one of the fewspots on her besides her face that hadnt seen SOME editing to comment on wasgratifying. Wow! Inspirational. I am always a little scared to take the scissors to my clothing but I guess it's better then letting it waste away in the closet. I might just have to give it a try on all those free t-shirts I end up with.